Rowan Areno never realized how one event could change the lives of so many people. Rowan is a normal sixteen year old girl who tries to cut school one day. Her police officer father finds her and brings her home, and because of this he is in the area when a call comes through about a man about to commit suicide on the overpass across from their house. Rowan and her mother watch through the window as Rowan’s father and an innocent boy walking his dog on the overpass try to convince the man not to kill himself and his three month old son. The results of this tragic event change the lives of all involved, and Rowan has to try to figure out how to move on with her life and deal with grief and loss. This book was so sad, but so good. Rowan’s parents are very overprotective of her, mainly because her father is a police officer and knows the kinds of things that can happen to teenage girls. Rowan is in that stage where her parents are annoying to her and she can’t understand why they are constantly trying to protect her. She wants to go out with her friend Nadia, who is a terrible influence and an even worse friend, and party with boys. But when the event on the overpass happens, Rowan begins to see life differently. Rowan’s father has a very hard time dealing with what happened on the overpass, especially once the police video of the event gets leaked to the press. The entire town has to give their opinion on how the event should have been handled, and many people don’t think Rowan’s father did his job properly. He sinks into a deep depression, and Rowan and her mother have to try their best to help him while they both deal with the entire town talking about them. Rowan finds comfort in a boy, Eli, who was walking his dog on the overpass the day of the event. He is also having trouble dealing with the fallout, and has experienced a recent loss in his life. Through Eli, Rowan is once again able to find happiness in life and is able to begin to move on and stop defining her life in terms of Before and After. Eli is a really great character, forced to grow up fast because of his loss, and he is extremely loving to his dog, Daisy. He and Rowan are able to help each other through the tough moments of their lives and they are both able to recover together. 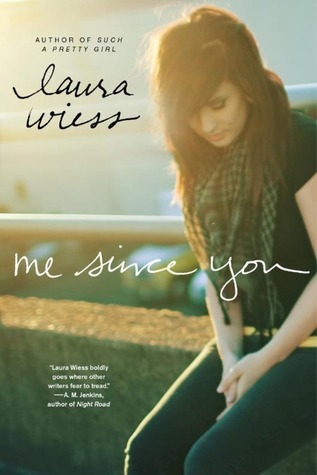 Overall, Me Since You was a really beautiful story about coping with loss. It was a really well written and powerful story that will definitely stay with you. Me Since You will be released on February 18, 2014.